← NACCHO Aboriginal Health and #WorldStrokeDay @strokefdn #UpAgainAfterStroke. One-third to a half of all our mob in their 40s, 50s and 60s are at high risk of future heart attack or stroke but the good news is more than 80 percent of strokes can be prevented. 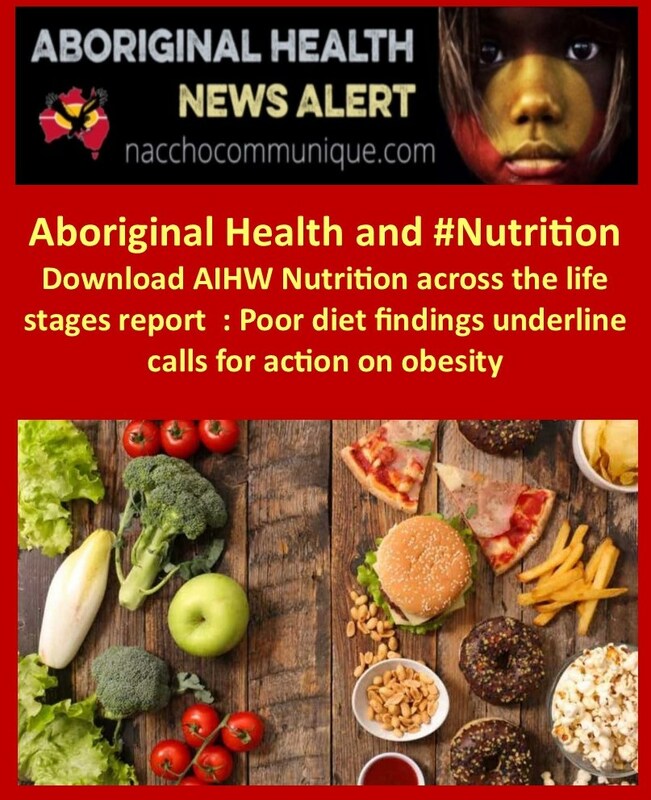 NACCHO Aboriginal Health and #Nutrition : Download @aihw Nutrition across the life stages report @CHFofAustralia Poor diet findings underline calls for action on #obesity now : More than one-third of Australians’ energy intake comes from junk foods. ” More than one-third of Australians’ energy intake comes from junk foods. Known as discretionary foods, these include biscuits, chips, ice-cream and alcohol. For those aged 51-70, alcoholic drinks account for more than one-fifth of discretionary food intake. ” Overall, the diets of Indigenous and non-Indigenous Australians are similar. However, Indigenous adults in some age groups eat less fruit, vegetables and dairy products and alternatives. 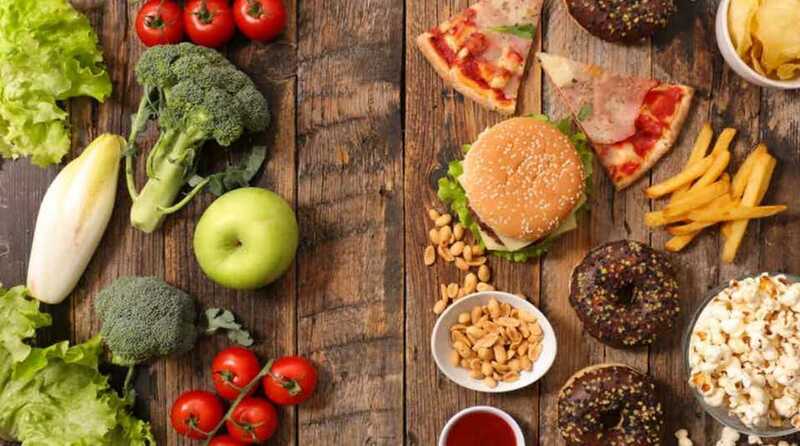 The report of the Australian Institute of Health and Welfare released today shows that Australians generally do not eat enough of the right food, like vegetables, and too much food rich in fat, salt and sugars. “These findings again vindicate calls over the years by health and community groups for concerted action on obesity and at last, Australia’s health ministers have agreed to develop a national strategy to counter this huge public health challenge,” the CEO of the Consumers Health Forum, Leanne Wells, said. “We welcome the decision by the COAG Health Ministers Council last week to develop a national plan on obesity. 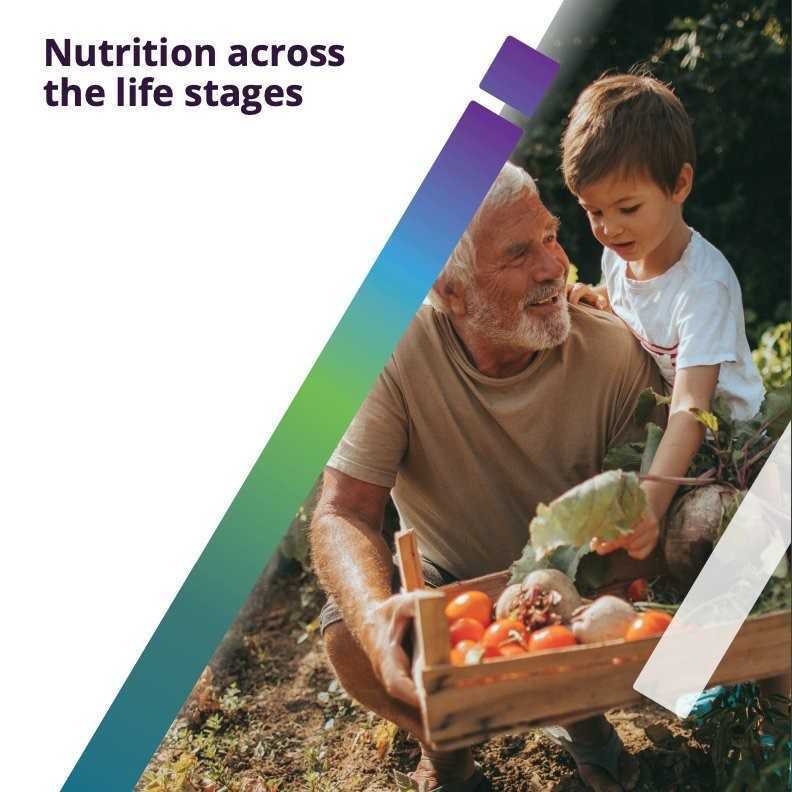 “As this new AIHW report Nutrition across the life stages, shows, there is great scope for improving diets of most Australians of all ages. This includes children whose formative diets do not include enough vegetables, teenagers who tend to eat too much junk food and even those in middle age whose alcohol intake is often too high. “It has taken too long to reach a national agreement for action on obesity. Now health ministers must move promptly to introduce effective measures. “Governments have a ready-made blueprint for action, provided by the Obesity Policy Coalition’s report Tipping the Scales, which CHF strongly supported. “After a comprehensive and expert investigation, that report proposed eight critical actions to tackle obesity. These included tougher restrictions on TV junk food advertising, food reformulation targets, mandatory Health Star ratings on food, an active transport strategy, public health education campaigns and a 20 per cent health levy on sugary drinks. The Health Ministers considered a number of aspects relating to obesity. They agreed that the national strategy should have a strong focus on prevention measures and social determinants of health, especially in relation to early childhood and rural and regional issues. The Consumers Health Forum has called for more effective measures to counter obesity over several years. In January 2015, with the support of the Obesity Policy Coalition, the Heart Foundation and the Public Health Association of Australia, CHF released the results of an Essential Research poll showing strong community backing for national action on obesity. That poll revealed that 79 per cent of Australians polled believed that if we don’t do more to lower the intake of fatty sugary and salty foods/drinks, our children will live shorter lives than their parents. Half of those polled then approved of the idea of a tax on junk food/sugary drinks. “We called then for the Federal Government to take decisive action to stop the never-ending promotion of unhealthy food and drink, particularly to young people. “Australia has lagged behind other nations in taking effective action against obesity which is one of the greatest triggers of chronic health problems which afflict a growing number of Australians. Unless we act now to arrest this trend, it will add up to even greater demands on our health system as it attempts to manage the growing levels of chronic disease in the community. “The time for talk is well past. We need action now,” Ms Wells said. Indigenous and non-Indigenous Australians, and found that overall, there is little difference. (for those aged 19–50), where intake is lower for Indigenous Australians. While the intake of added sugars appears higher among Indigenous Australians than non-Indigenous Australians, this is only significant in those aged 19–30 and 31–50. Intake of saturated and trans fats and sodium are similar for Indigenous and non-Indigenous Australians. 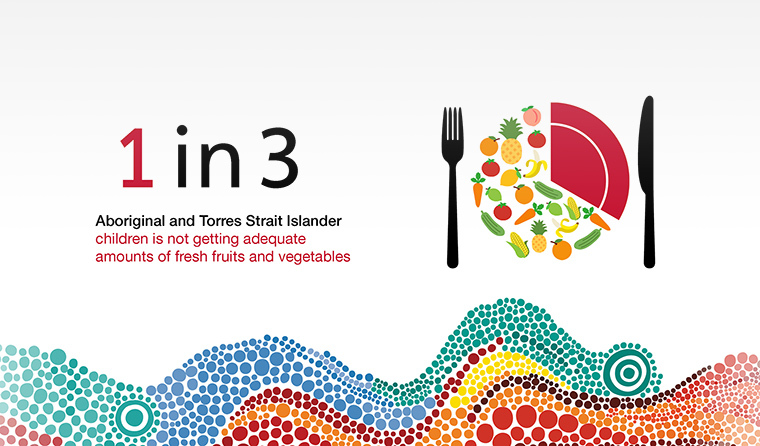 Fibre intake for Indigenous Australians aged 19–30 and 31–50 is lower than for non-Indigenous Australians. The small survey sample for Indigenous Australians makes comparisons difficult when looking at levels of physical activity as there is a high margin of error, so results should be interpreted with caution. Levels of sufficient physical activity appear higher in Indigenous Australians; however, in most cases, the differences are not statistically significant. The only exceptions are children aged 4–8 and boys aged 9–13, where the levels are higher in Indigenous Australians. For adults aged 19–30 and 31–50, non-Indigenous Australians have higher levels of physical activity. For males, the prevalence of overweight and obesity does not differ by Indigenous status. However, for women, from the age of 19, the prevalence is higher among Indigenous women than non-Indigenous women. 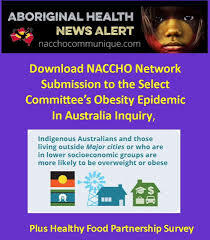 Among Indigenous Australians, there is no difference in the prevalence of overweight and obesity between males and females, unlike non-Indigenous Australians, where from the age of 19, the prevalence is higher in men than women. Diet quality among Indigenous Australians may be affected by the remoteness of the area in which they live, as a higher proportion of Indigenous Australians live outside of Major cities than non-Indigenous Australians (AIHW 2018a). Hudson (2010) suggests that many Indigenous Australians know what foods they need to maintain health; however, supply and affordability of fresh produce appear to be limiting factors in dietary quality. Limited stock of fruit and vegetables have been found in remote shops near Indigenous communities, with some areas going without a delivery of fresh produce for weeks. And what is available is expensive. When deliveries are received, stock can be up to 2 weeks old, so of poor quality. Additionally, lack of competition in these areas appears to be a factor with price. Fibre-modified and fortified white bread appears to provide a large proportion of energy and required key nutrients for Indigenous Australians living in remote areas (in particular protein, folate, iron and calcium) (Brimblecombe et al. 2013a; Brimblecombe et al. 2013b; Gwynn et al. 2012). The diet of Indigenous Australians have for some time, been shifting from traditional Indigenous diets that were previously high protein, fibre, polyunsaturated fat and complex carbohydrates to a more highly refined carbohydrate diet, with added sugars, saturated fat, sodium and low levels of fibre (Ferguson et al. 2017). This may be due to lack of access to traditional food and general food affordability (Brimblecombe et al. 2014). Lack of facilities to prepare and store food such as refrigerators and stovetops, have also caused an increased reliance of ready-made meals or takeaway foods for Indigenous Australians living in remote areas (Hudson 2010). The report also shows physical activity levels are low in most age groups. Only 15% of 9-to-13-year-old girls achieve the 60-minute target. The prevalence of overweight and obesity remains high, reaching 81% for males aged 51–70. The food intake patterns outlined in this report, together with low physical activity levels, highlight why as a country we are struggling to turn the tide on obesity rates. The report shows little has changed in Australians’ overall food intake patterns between 1995 and 2011-12. There have been slight decreases in discretionary food intake, with some trends for increased intakes of grain foods and meat and alternatives. The message to eat more vegetables is not hitting the mark. There has been no change in vegetable intake in children and adolescents and a decrease in vegetable intake in adults since past surveys. The new data show all Australians fall well short of the recommended five serves daily. We are are closer to meeting the recommended one to two serves of fruit each day. Australians are consuming around four serves of grains, including breads and cereals, compared to the recommended three to seven serves. One serve of vegetables is equivalent to ½ cup of cooked vegetables. For fruit, this is a medium apple; grains is around ½ cup of pasta. A glass of milk and 65-120g of cooked meat are the equivalent serves for dairy and its alternatives, and meat and its alternatives respectively. 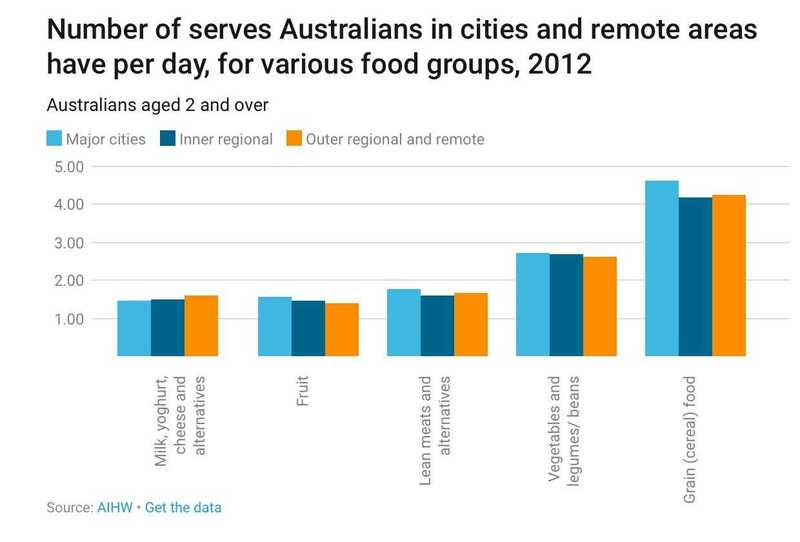 The data show a trend of lower serves of the five food groups in outer metro, regional and remote areas of Australia. Access to quality, fresh foods such as vegetables at affordable prices is a key barrier in many remote communities and can be a challenge in outer suburban and country areas of Australia. There was also a 7-10 percentage point difference in meeting physical activity targets between major cities and regional or remote areas of Australia. Overweight and obesity levels were 53% in major cities, 57% in inner regional areas and 61% in outer regional/remote areas. The CSIRO Healthy Diet Score compares food intake to Australian Dietary Guidelines. You can use these to see how your diet stacks up and how to improve. not needed to meet nutrient requirements and do not fit into the Five Food Groups … but when consumed sometimes or in small amounts, these foods and drinks contribute to the overall enjoyment of eating. A serve of discretionary food is 600kJ, equivalent to six hot chips, two plain biscuits, or a small glass of wine. The guidelines advise no more than three serves of these daily – 0.5 serves for under 8-year-olds. Since 1995, the contribution of added sugars and saturated fat to Australians’ energy intake has generally decreased. 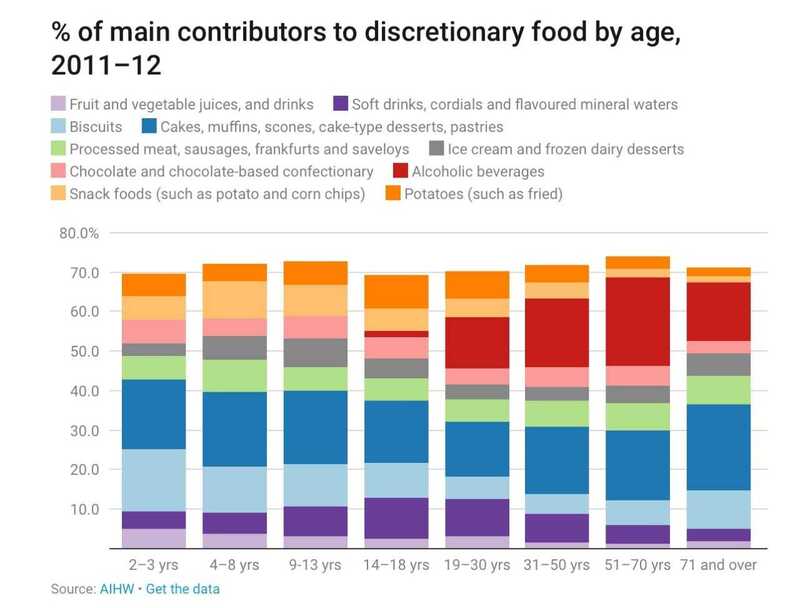 This may be a reflection of the small decrease in discretionary food intake seen for most age groups. But across all life stages, discretionary food intakes remain well in excess of the 0-3 serves recommended. Children at 2-3 years are eating more than three servers per day, peaking at seven daily serves in 14-to-18-year-olds. The patterns remains high throughout adulthood, still more four serves per day in the 70+ group. The excess intake of discretionary foods is the most concerning trend in this report. This is due to the doubleheader of their poor nutrient profile and being eaten in place of important, nutrient-rich groups such as vegetables, whole grains and dairy foods. Our simulation modelling compared strategies to reduce discretionary food intake in the Australian population. We found cutting discretionary choice intake by half or replacing half of discretionary choices with the five food groups would have significant benefits for reducing intake of energy and so-called “risk” nutrients (sodium and added sugar), while maintaining or improving overall diet quality. For healthy men and women, drinking no more than two standard drinks on any day (and no more than four standard drinks on a single occasion) reduces the lifetime risk of harm from alcohol-related disease or injury. For adults aged 51–70, alcoholic drinks account for more than one-fifth (22%) of discretionary food intake. Alcohol intake in adults aged 51-70+ has increased since 1995. This age group includes people at the peak of their careers, retirees and older people. Stress, increased leisure time, mental health challenges and factors such as loneliness and isolation would all play a part in this complex picture. Young children have small appetites and every bite matters. The guidelines suggest 2-to-3-year-olds should have very limited exposure to discretionary foods. In, studies the greatest levels of excess weight are seen in preschool years. Biscuits, cakes and muffins are the key source of added sugars for young children. These are also the top source of energy and saturated fat and a key source of salt in young children. This is the time when lasting food habits and preferences are formed.